Ancient racer wisdom: "Know your weaknesses, use your abilities." 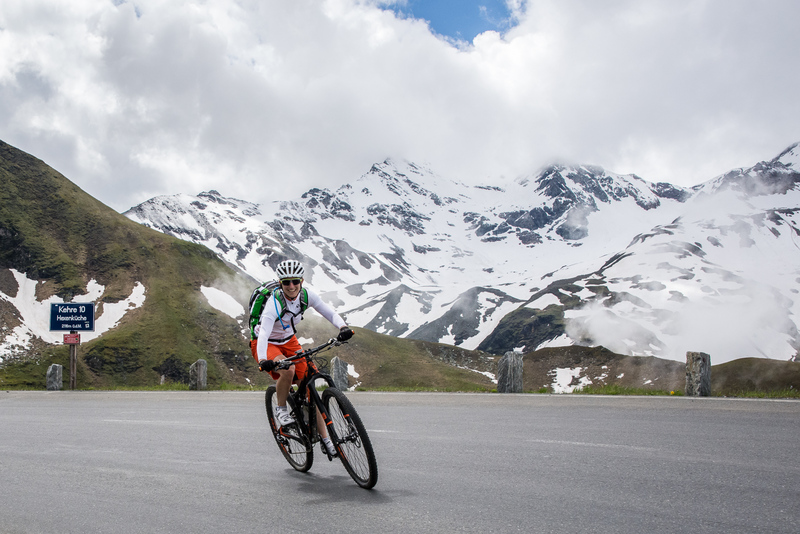 Clever people also apply this adage to their racing career, thus choosing test bikes with corresponding consideration: Rather generous gear range, comfortable designs, practical equipment. Gone are the days of being well trained, tweaking something here and there with only your own funds as a sponsor for scrap material. 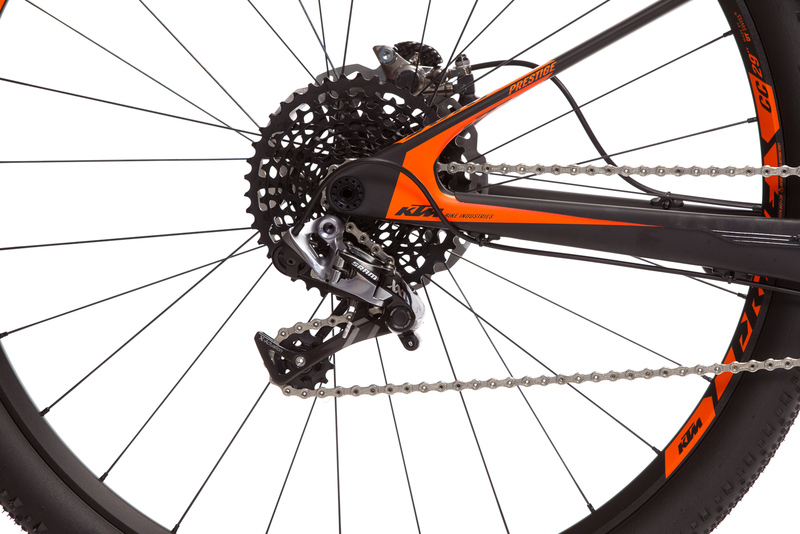 The KTM Scarp 29 Prestige 11 certainly doesn't fall into that category: Single chainring, andnot the smallest one either. 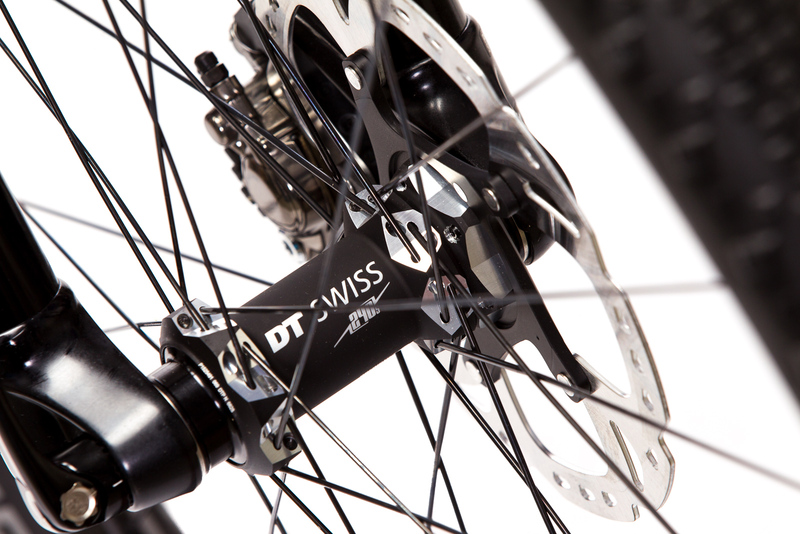 Race geometry, that is modern but uncompromising. Every part equipped is far too good and expensive. Yet I've never been so glad to have decided against my gut feeling. 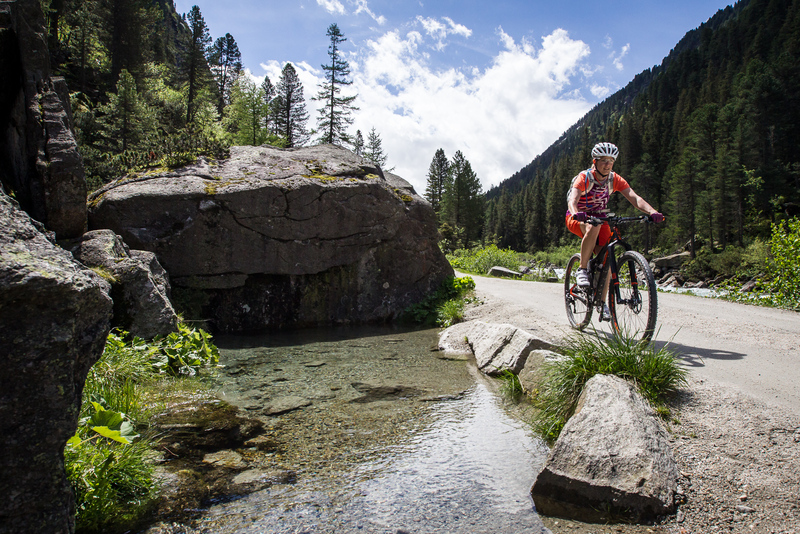 After three weeks with the 2016 version of the Upper Austrian Race Fully, it was indeed time for a new racer wisdom: "Ignore your weaknesses, use your Scarp." But first things first. "Ignore your weaknesses. 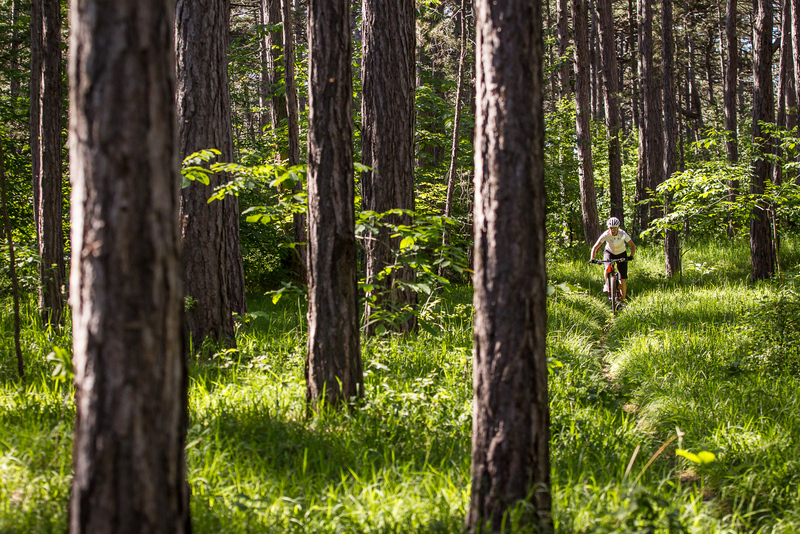 Use your Scarp." 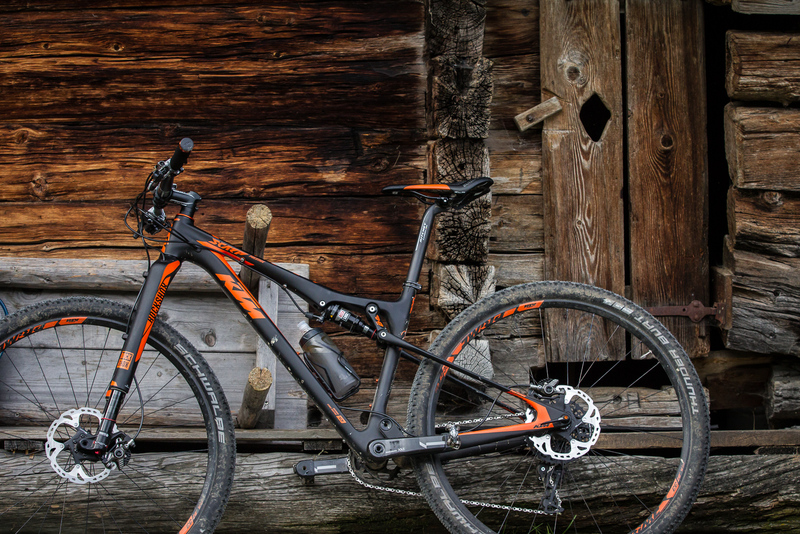 After utilizing PDS (the acronym stands for Pro Damping System) for a few years, KTM shook things up last summer: The proven rear suspension system of the fullies with 90 to 125 mm would be given up in favour of a completely new construction and be replaced by the SLL technology. "Too heavy" was the primary complaint regarding the old rear end, which used a vertically positioned, floating damper. The Mattighofeners thought that they had found something more contemporary and especially lighter with the Straight Line Link. This assertion can be confirmed in terms of weight. The incorruptible BB scale still adds four packs of Manner Original Neapolitan Wafers to the manufacturer’s specification of 9.8 kg. This comes to ten kilos and a few hazelnut crumbs. 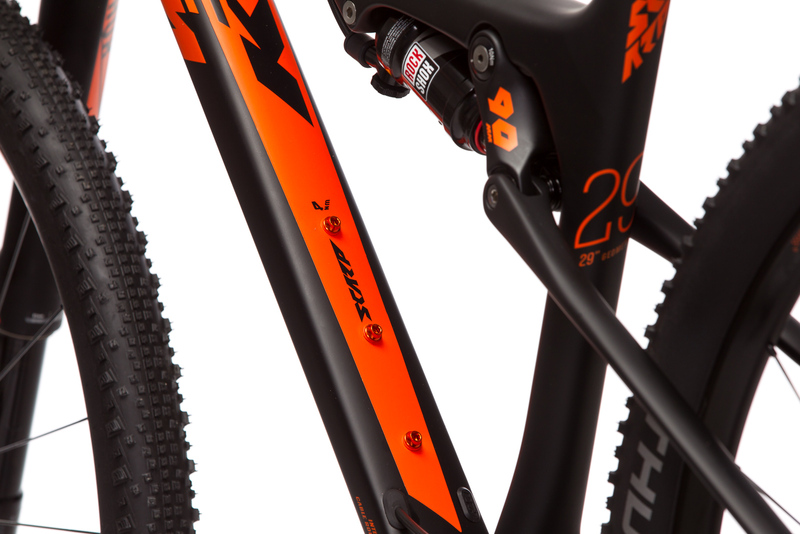 This is more than okay for a full-suspension twentyniner, however, achieved with tires that do not allow for real off-road use. More later, regarding the new kinematics. 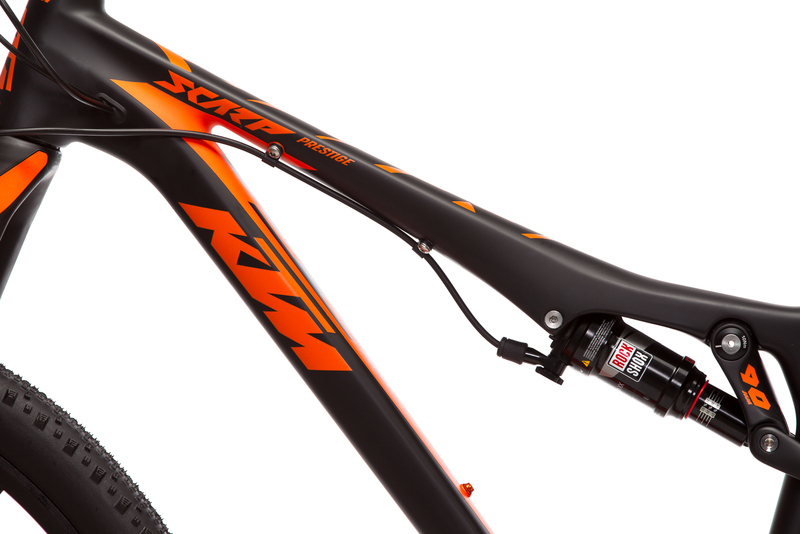 First, the technical facts: SLL is the fundamental new development at KTM for 2016 and is used in all Scarp, Lycan and Kapoho models. 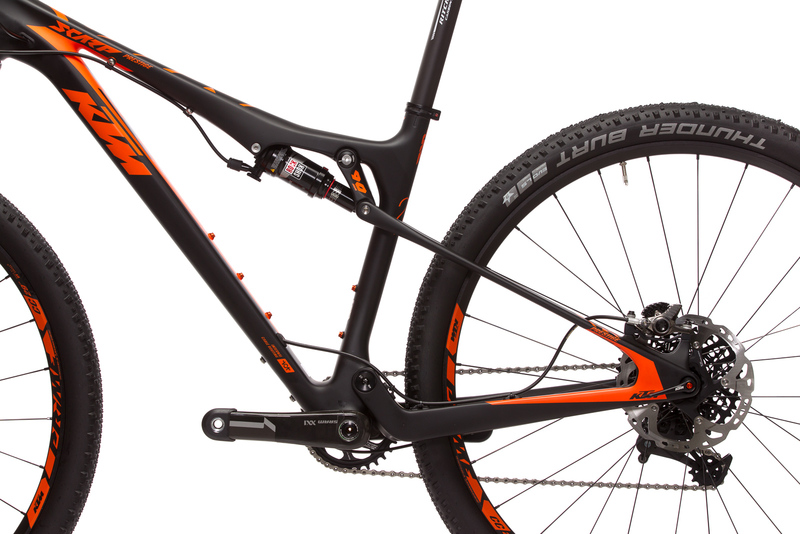 Only the 160 mm fullyies (Lycan LT) remain unchanged. 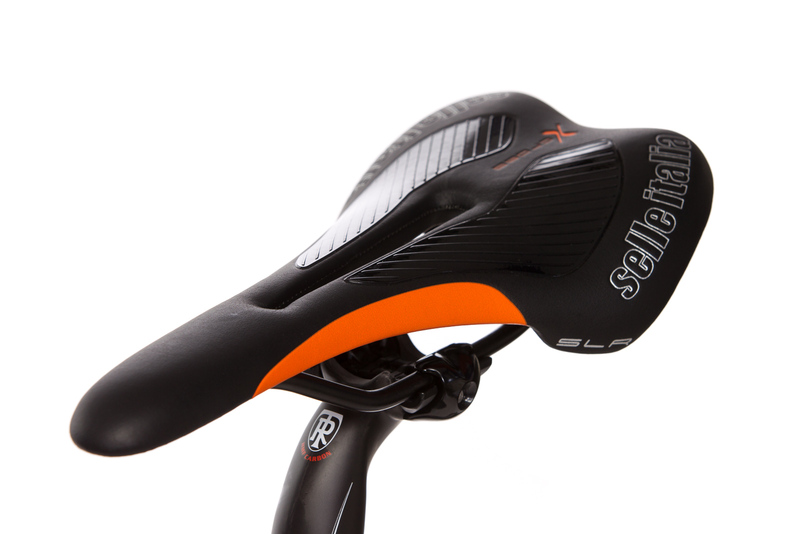 The new SLL damper is placed horizontally below the top tube. 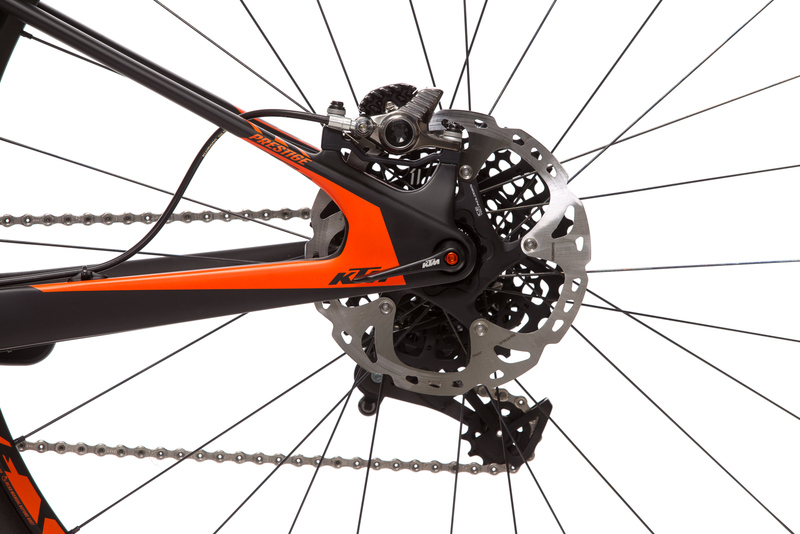 This will result in less load on the frame, resulting in less required material and thus lower weight. The rocker ("Rocker Blade") is an additional feature of the system; in the high-end models (Scarp and Lycan) it is made of carbon, resulting in a 40% weight reduction according to the manufacturer. 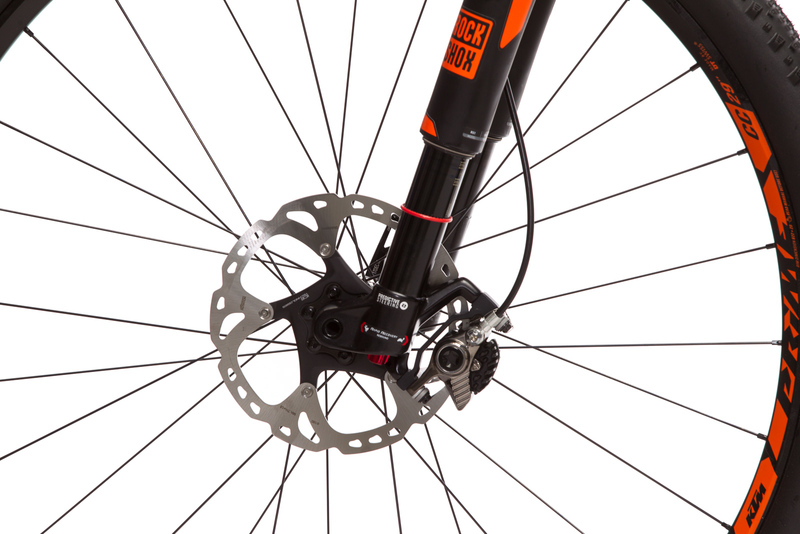 Combined with the new linkage, the damper is supposed to absorb loads more directly. 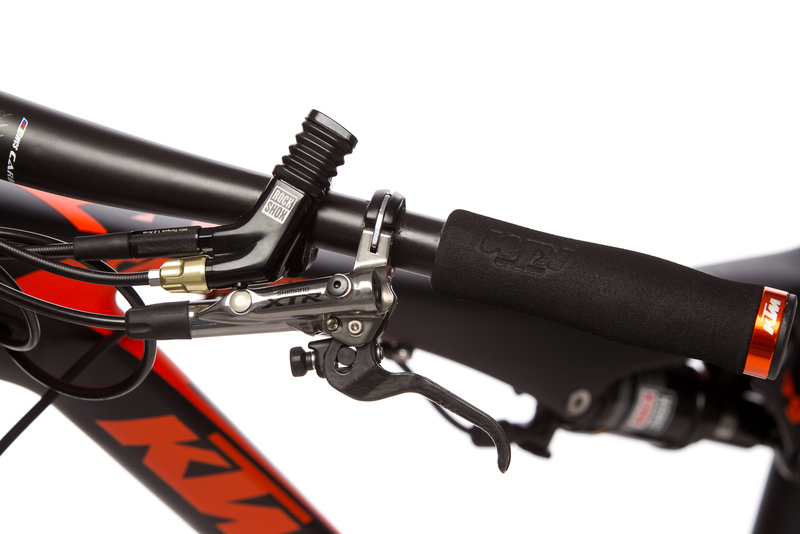 On the other hand, flexing seat stays complete the SSL technology. 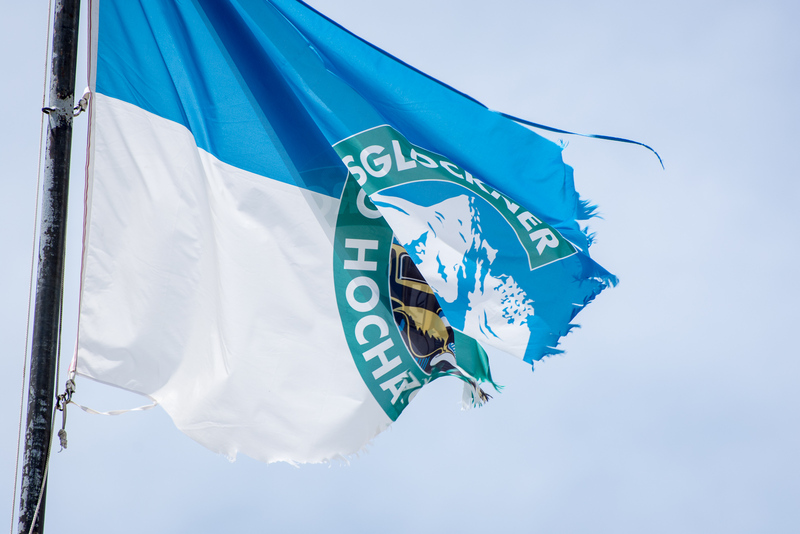 They replace the fourth bearing point at the dropout – a side effect of the elimination: Weight reduction and greater stiffness. 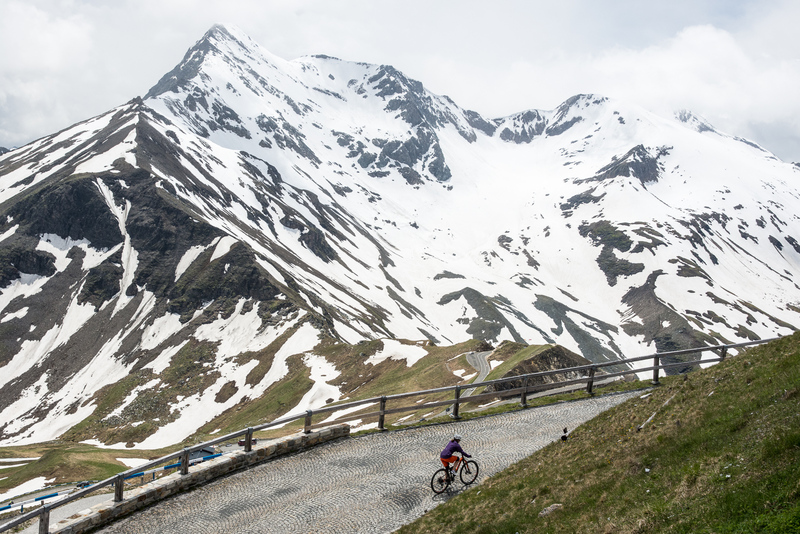 Visually, this results in a very sleek, forward-oriented bike – made of high-quality UD fibers – without a hint of experimentation in terms of design. 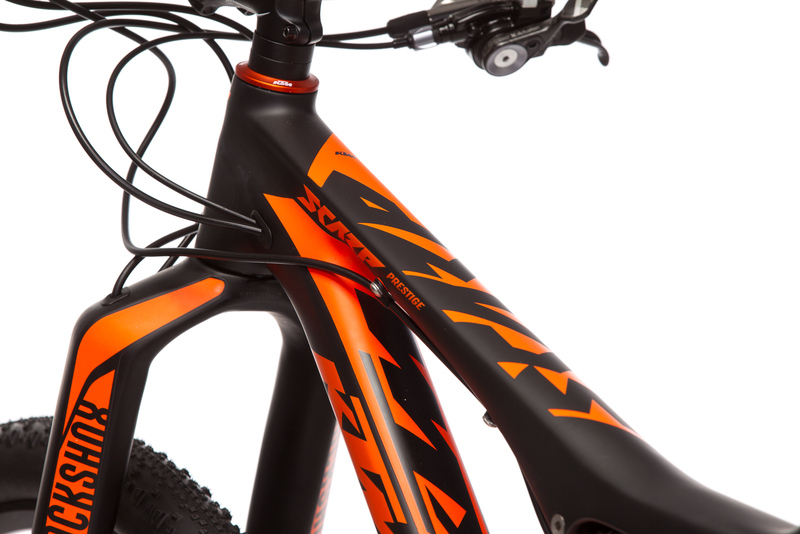 A KTM racer must be black and orange, period. Paired with the matching colour accents on wheels, saddle, fork and handlebars, it does pull the look off with consistency, which hides the somewhat unimaginative paint job. 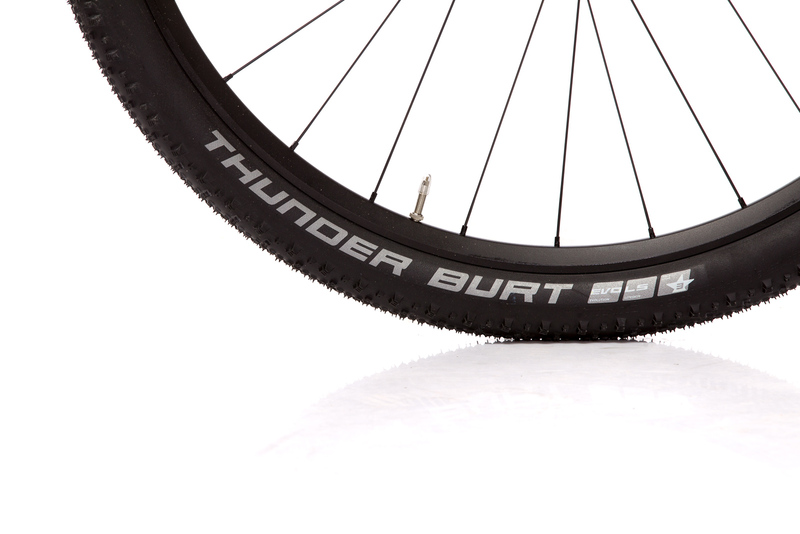 Without a corresponding indicator, lettering or similar, a boost hub in the rear wheel could almost be overlooked. Six millimetres more installation width leads to greater stiffness at the end of all physical considerations. 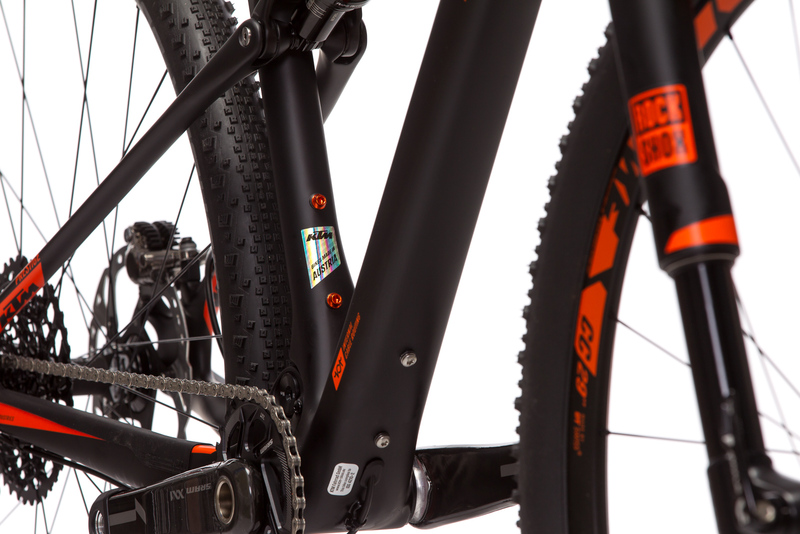 The through axles, the press-fit bottom bracket, the tapered head tube and many more details accomplish the same. 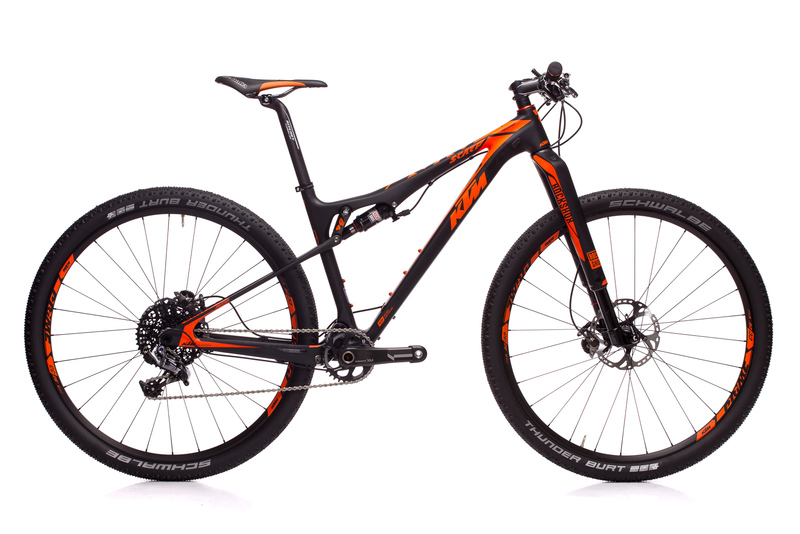 Even without a degree in advanced mathematics, it sounds logical that KTM proclaims a significant improvement in terms of rigidity for the new Scarp. The passion for detail is discernible through the entire package. 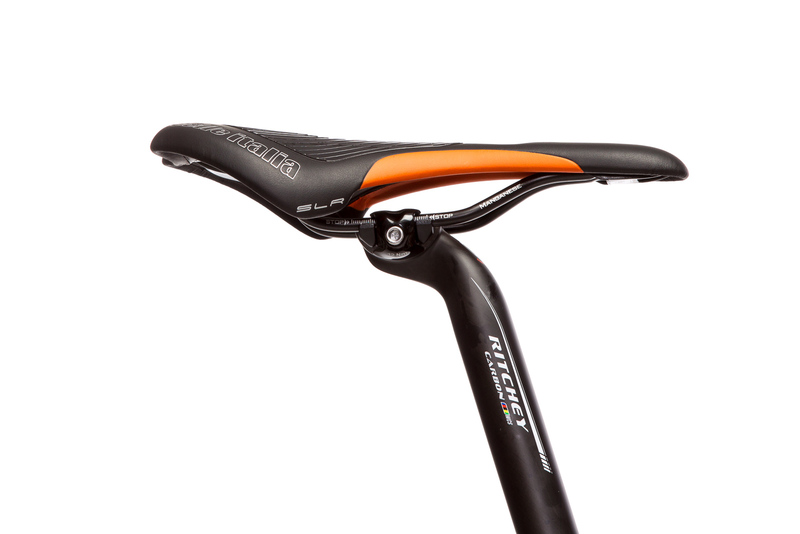 Protective film was applied to locations that never used to garner attention (for example the inner sides of seat stay) in a discreet and highly effective manner. 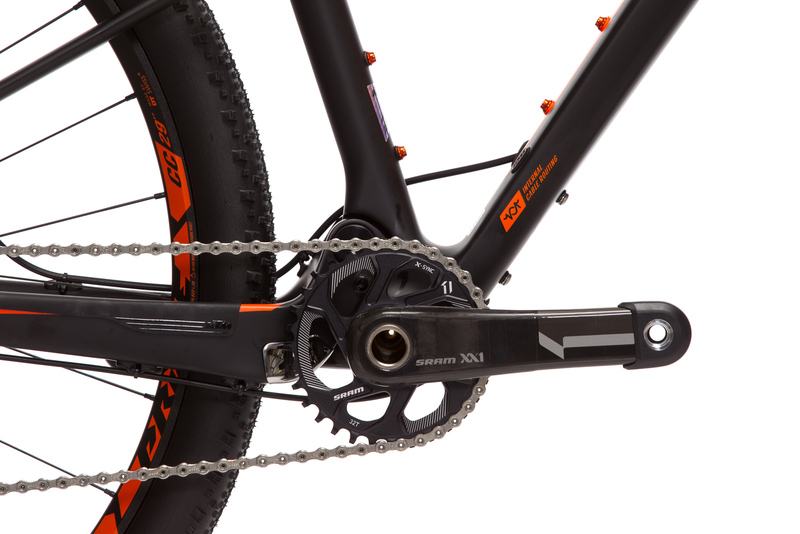 The chainstay protection is also elegant, as are the rubber protectors on the crank arms. In general, the processing appears to be top class, the matte black is slick and the cable housing tidied up elegantly. 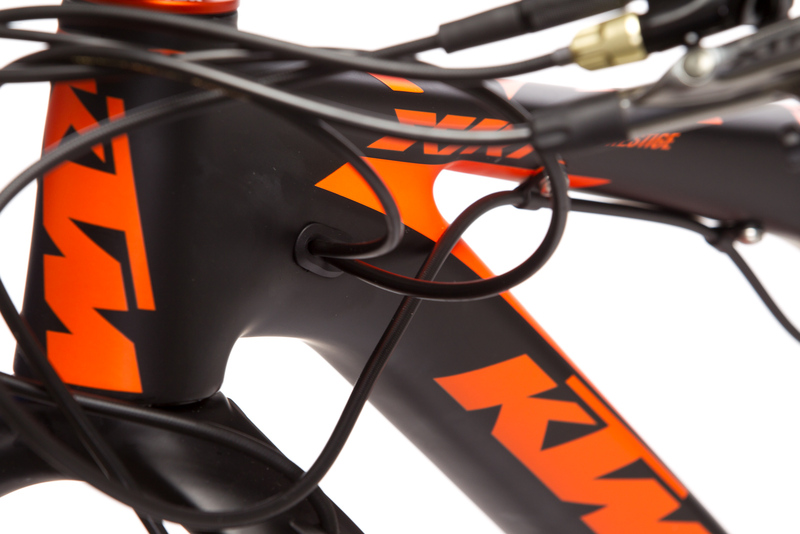 The possibilities for bottle cage mounting (basically two positions, at the down tube also a third hole for a 1 liter bottle or other placement alternatives) are well intended, but are obsolete with the smallest frame, because it cannot hold more than a 620 ml bottle. 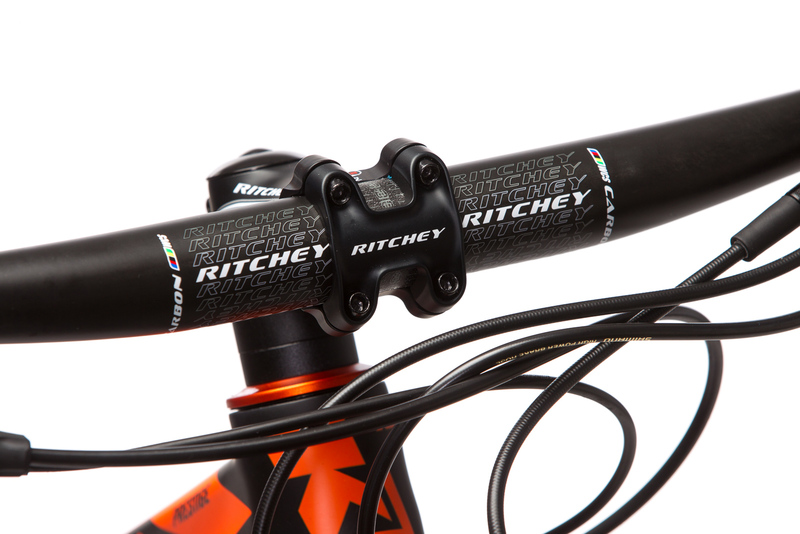 The race fully with 90mm travel at the rear – tested in the full carbon version here – is also availabe in an aluminium and carbon fiber mix (main frame & rocker link made of carbon), as well as models manufactured entirely out of the light metal. 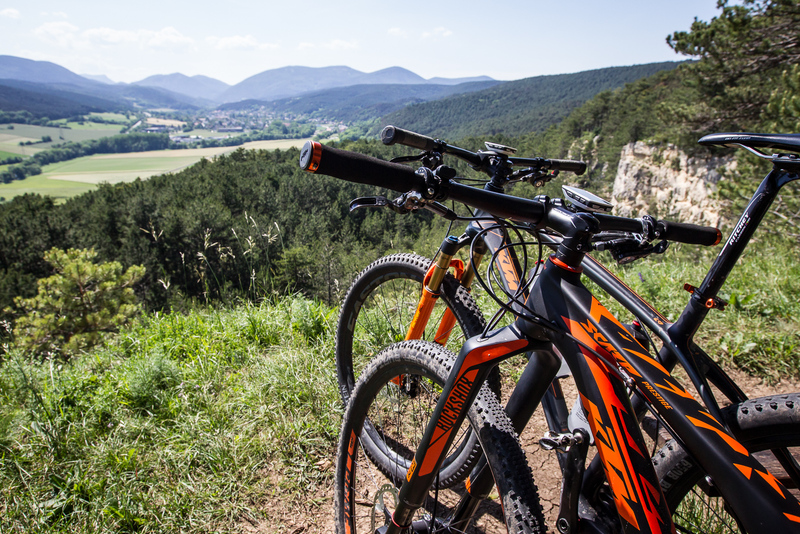 For the aluminium introductory model, there are two configurations (€ 2,299/2,999), the mid-level model is the Scarp Elite at 3,199 Euros, and the highest quality frame is available in five models between € 4,499 and € 6,899. 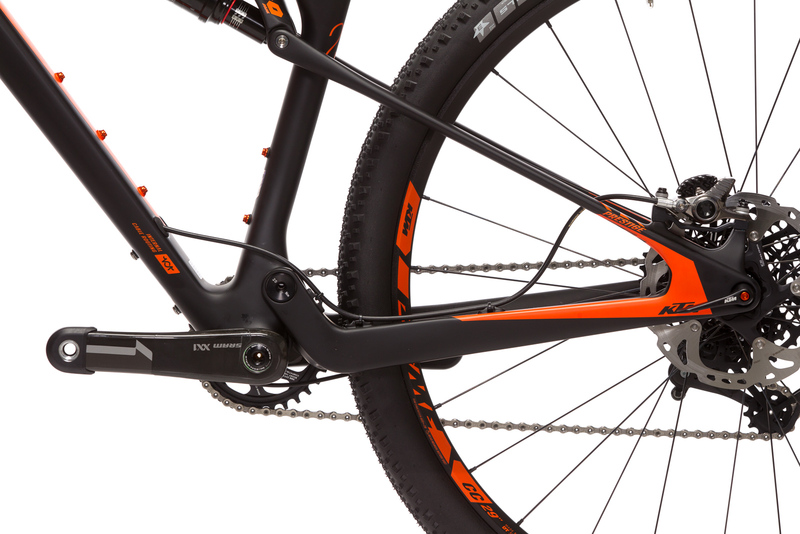 The boost rear frame stay is only available with the highest model line. In other words, we're looking at a luxury class. 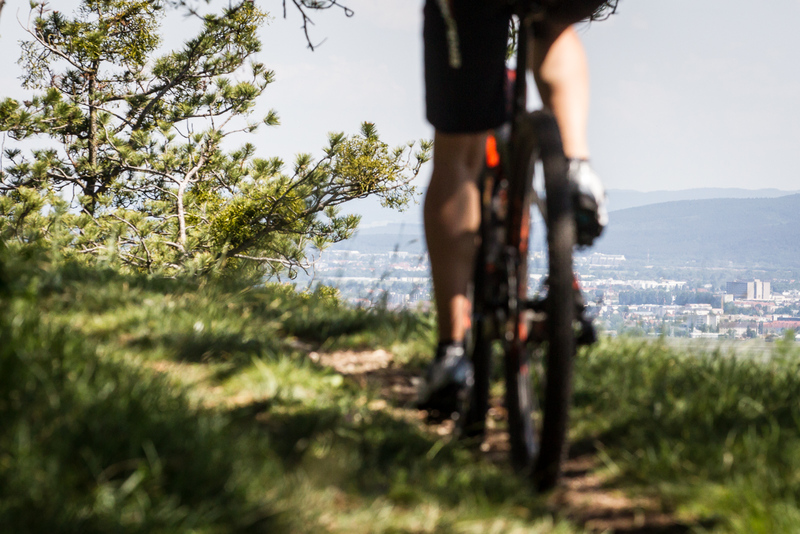 Accordingly, the fittings of the test bike are: From RockShox's exclusive RS-1, to Sram's best gearing and Shimano's brakes, the highest quality up to the classy lightweight wheels made by DT Swiss, only the finest goods can be found in the top version of the Scarp line. The functionality of all these parts is excellent. Gears are engaged with the precision and speed of an automatic weapon, and somehow it also sounds like one: clack-clack-clack-clack, each touch is a hit, regardless of how many gear changes are necessary within a short time or under the highest load. Deceleration is free from drag and squeals under perfect modulation – not least thanks to the two 180 mm discs – with lasting reliability. 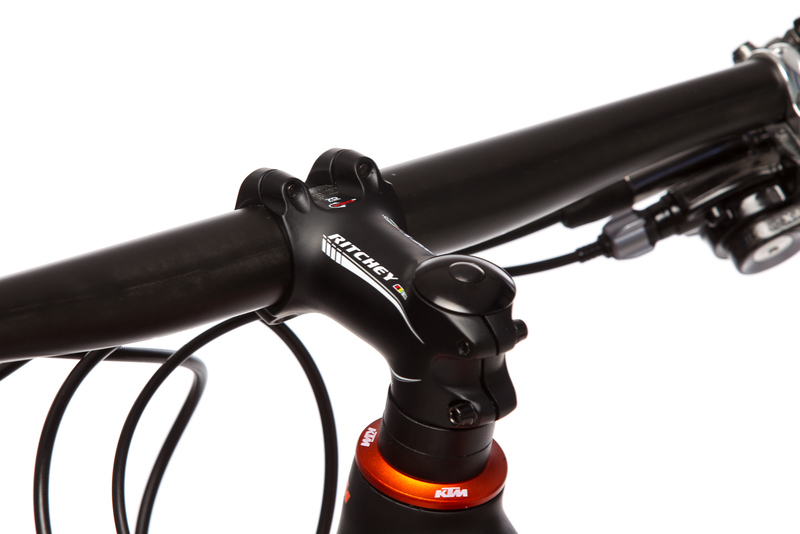 The brake levers ergonomics are outstanding. Something that cannot be said for the remote lockout for the fork and shock, which requires some extra bit of pushing power and requires the thumb to be stretched somewhat. The saddle was a bit too narrow for the test pilot but we like that the sturdy design and sophisticated seating comfort prevailed over a construction focused purely on light weight. 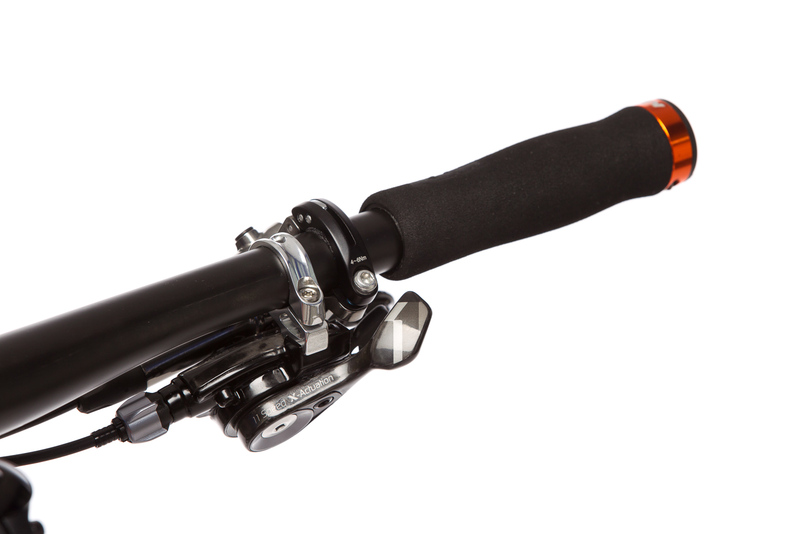 The (slightly heavier) mounted bolt-on grips are also preferred to slide-on variations. Insofar it is all the more incomprehensible that savings were made with the seatpost quick release. This is missed when loading into the car at the latest. By the way: The inside of the frame is of course designed for use of a telescopic seatpost as well as for an electronic shifting system. The handling of the RS-1 becomes a bit irritating when it comes to installing and removing the wheel. 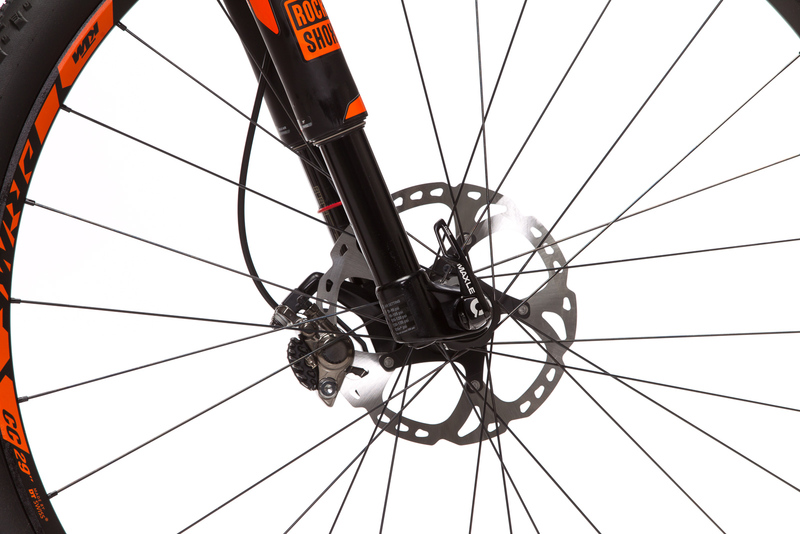 Because of the extending and rotating left dropout and the fiddly insertion and even removal of the thru axle, you could get envious of colleagues equipped with SID models or Fox forks, which are travel-ready faster in an unequalled manner. 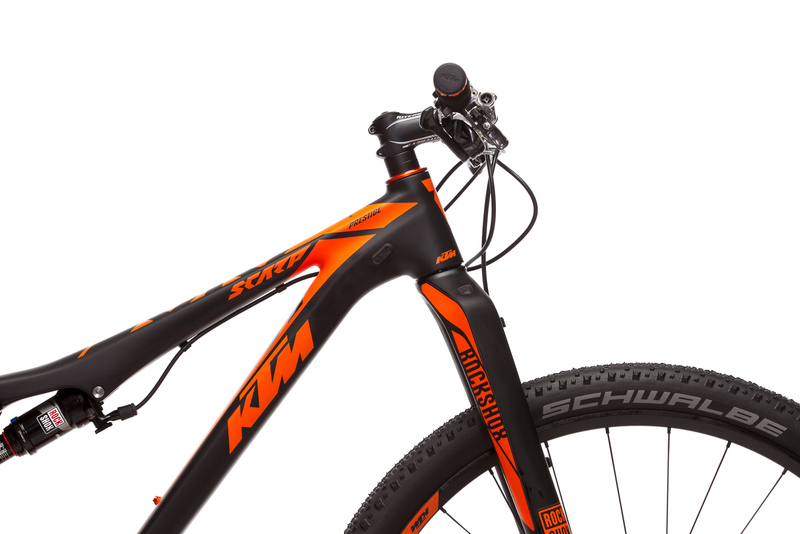 In terms of form, KTM has positioned the Scarp on the sporty side without compromise. 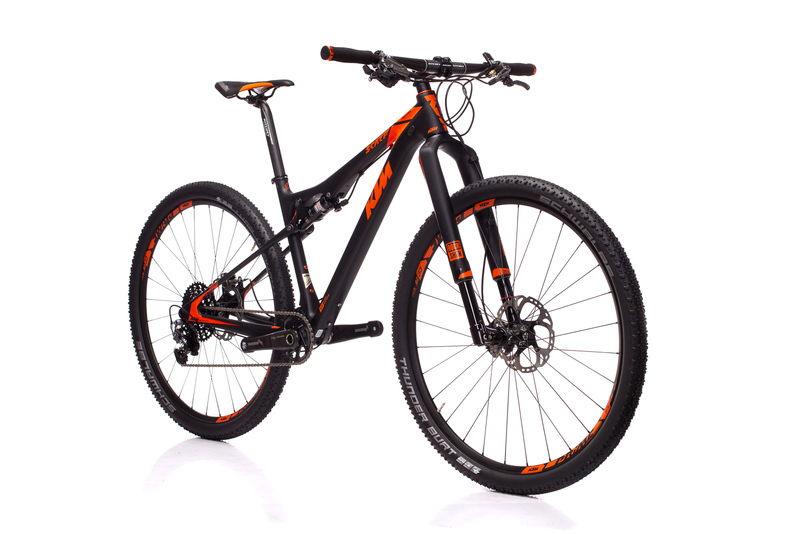 The seat angle of the 29" bike is marginally steeper (0.5 °) compared to the predecessor and should ensure improved force transfer comparable to the hardtail Myroon. The bottom bracket and the center of gravity of the frame are now lower. 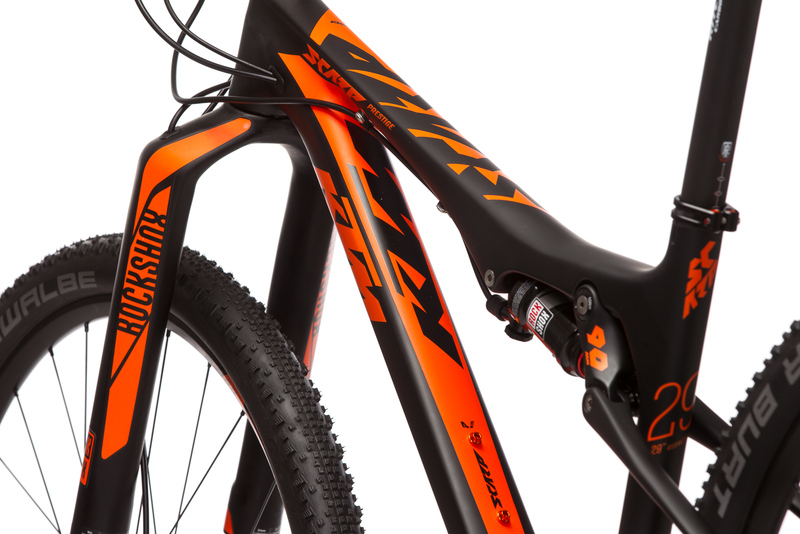 The elongated top tube provides more reach, allowing for use of a shorter stem, resulting in an overall positive effect on the bike handling, in combination with the 70° headtube angle. For the female test pilot, who is normally well placed with 17" size frames, this design proved to be slightly too long. She also removed a spacer from underneath the stem, which fit the characteristics well. 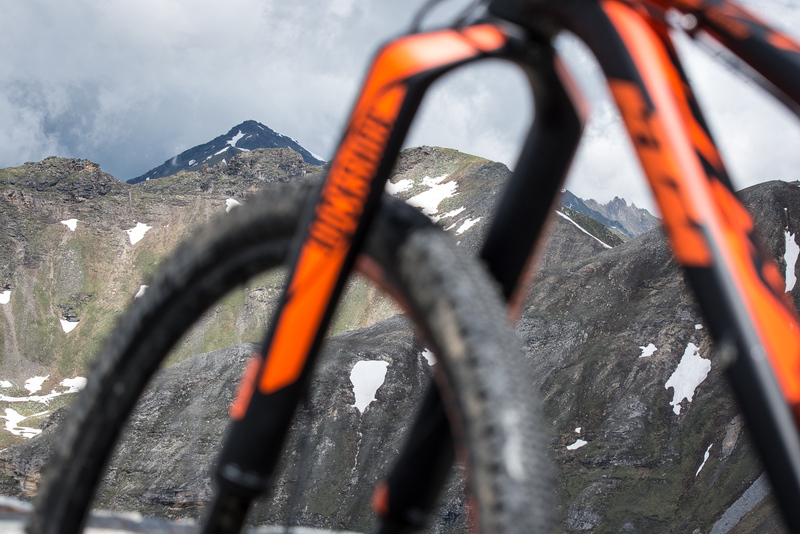 Strictly speaking: People who are smaller than 1.70 m and of average proportions must grow some more for the new Scarp, because a 15" frame size does not exist. This much theoretical stiffness, efficiency and little weight leads to enormous expectations. 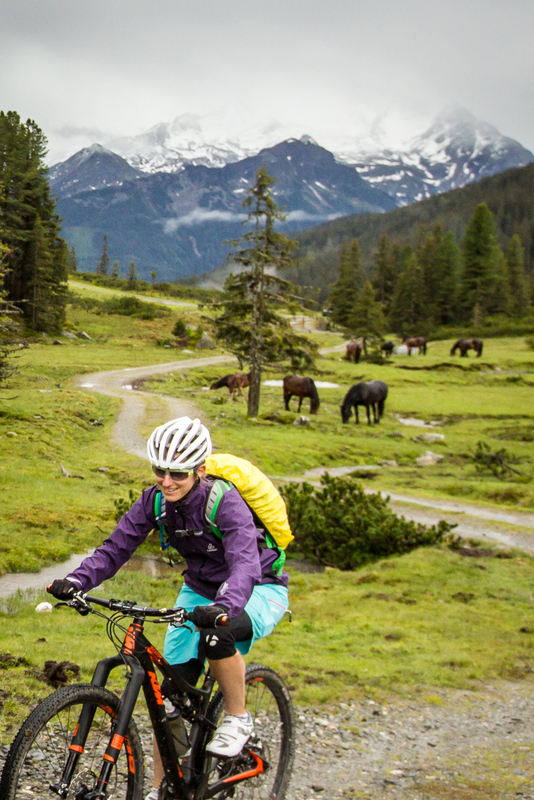 Luckily, as soon as the pedals start turning the KTM feels like it can live up to its advance praise: The bike clearly wants to storm forward, to the head of the pack, and into the lead. 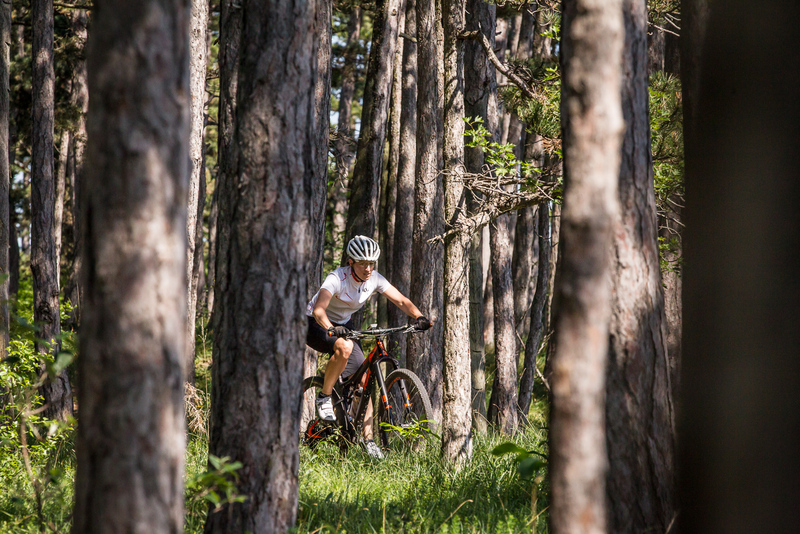 With locked suspension, it turns out to be an elegant (forest) road racer, which can almost compete with disc road racers due to the semi slicks and light weight. Other fullies have a lockout mode that feels like you are sitting on a bouncy rubber ball. 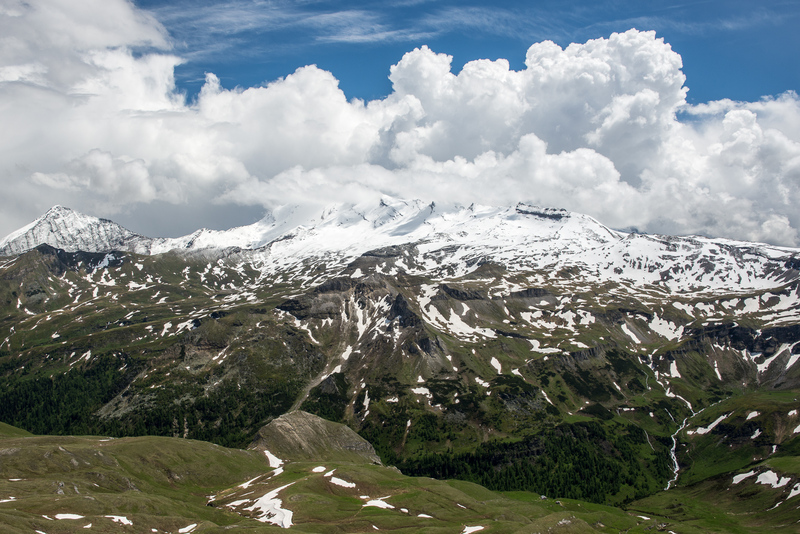 This is notably absent, which is why the Scarp also quickly became the weapon of choice for climbing the Großglockner, just because an opportunity arose. In its open mode, the rear end's suspension is always moving slightly, even when running the suspenion in a stiff setup. However, this visible rocking does not affect the pedaling motion in any way. What remains is remarkable sensitivity that pleasantly levels everything from the smallest bumps to larger gravel. That is a huge plus, particularly with regard to traction. 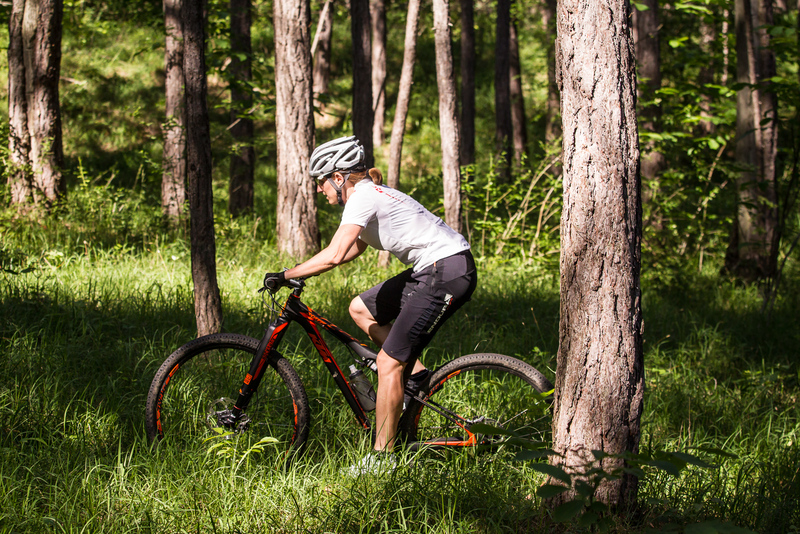 Apart from the fact that the tires quickly loose traction at the rear, there are a lot of available alternative options to fit your ridding needs. The sensitivity at the front is similar: The RS-1, which is visually polarizing, but very harmoniously integrated on the Scarp, reacts to everything and everyone, but never too much. The bottom line results in superb cruising capabilities, never without feedback from the ground, but always gently smoothed out. "To the front, to the head of the pack and into the lead." Wherever the Scarp wants to go. 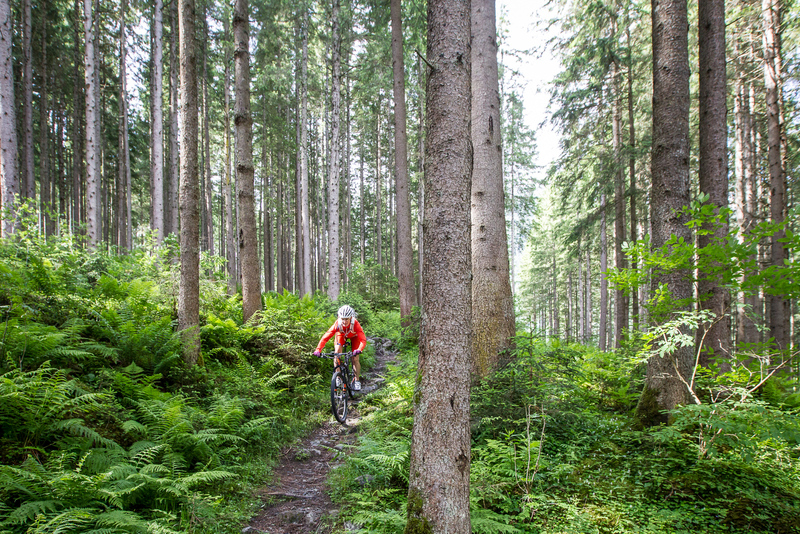 In rougher terrain, the imminent end of the road is feared, especially since the rear shock appears to already use a large part of its capacity, even when set to a sag of not even 20%. 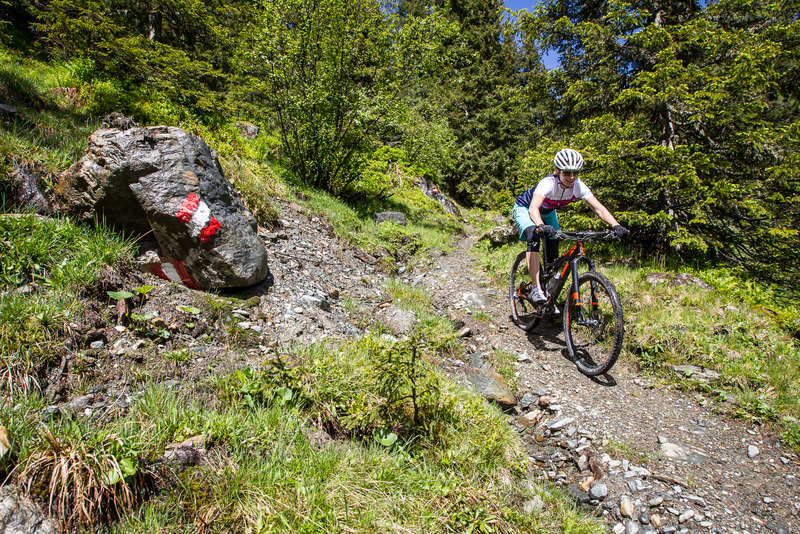 However, if the fun has ended prematurely, it is only due to the dubious tires (Thunder Burts track well during bone-dry conditions; as soon as the forest turns slightly slimy or damp, one inadvertently changes sport categories and turns into an ice skater. At least we came out flat free during our test period), and certainly not because of the performance of the suspension. 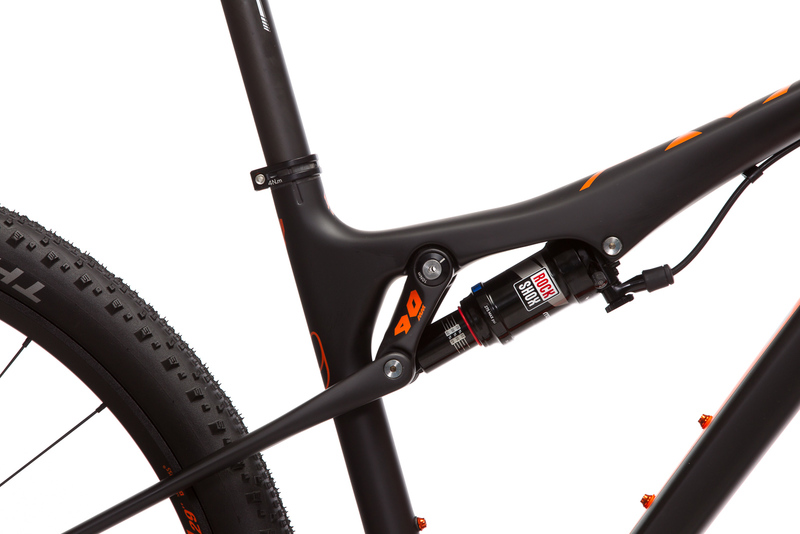 As promised by KTM, the rear shock utilizes the travel generously at large impacts without sagging. Bottom-outs? No. The fork is functionally on par and also fought successfully against a prejudice nourished by other reviews: a nervous flutter when things get really fast? Not a bit. It may be possible that several kilograms less body weight play a role and that the convincingly stiff wheels compensate for a lot regarding this. 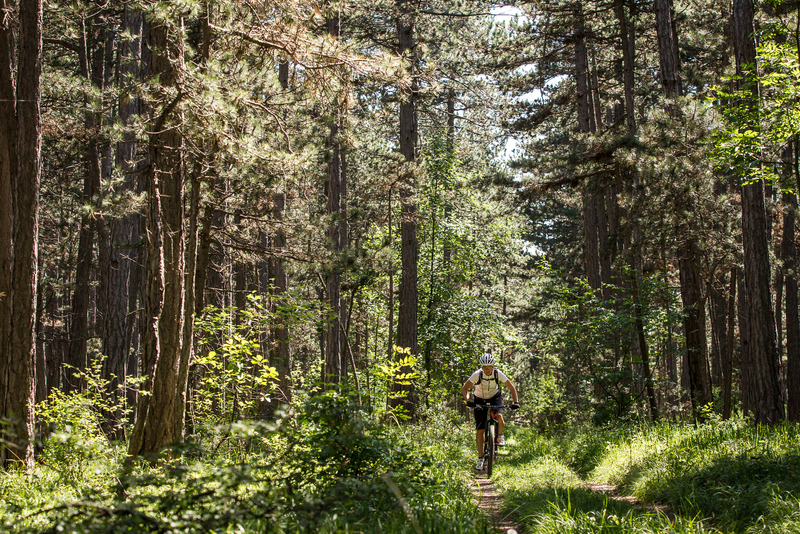 Anyway, the Scarp Prestige stoically kept its track on high-speed passages from rugged fire roads to our favorite singletrail. Which brings us to the general handling. 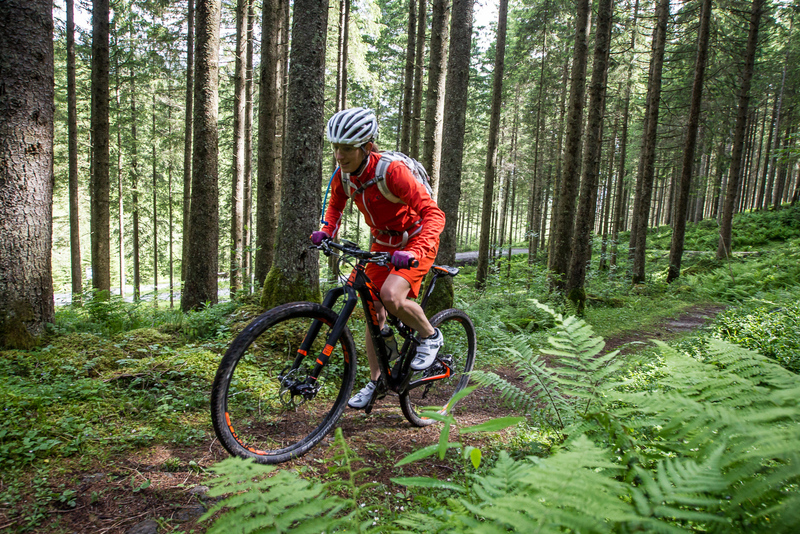 Usually, you don't throw a twentyniner quickly around the tightest corners, particularly if you are a few centimeters too small for the test bike, which does not make things easier. Therefore, a 1.73 cm tall co-tester was brought on board, who eventually confirmed NoMan's impression: The race-fully can be steered in a very accurate manner and can be turned as briskly and quickly as can be expected from a high quality race-fully, and it is as agile as necessary. 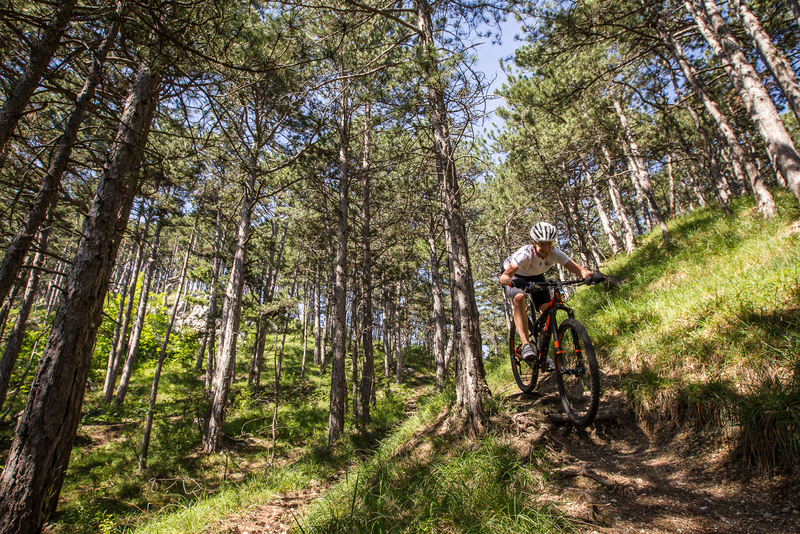 However, an extra curvy terrain will nevever be its specialty event. However, it is brilliant when it comes to forward drive, acceleration and liveliness, it thus preferably acts out its agility when the wheels point uphill – even when things get steep. 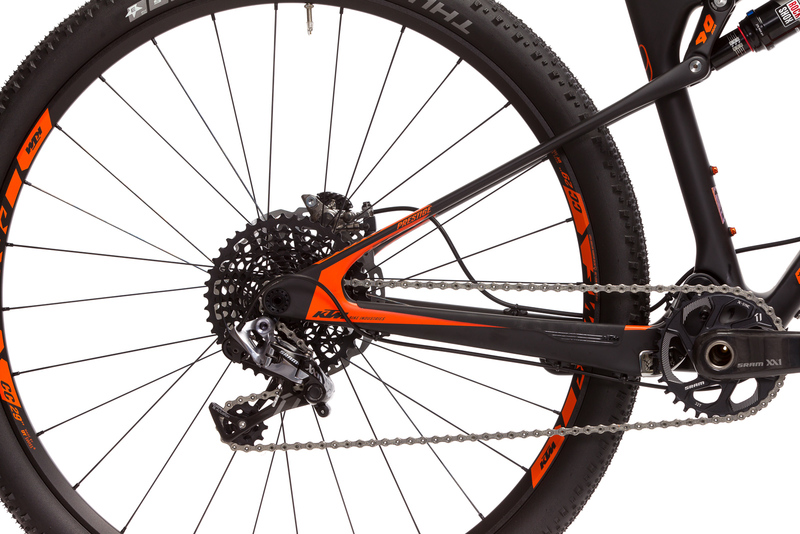 This is helpful insofar, as a 32-tooth chainring on the twentyniner is still strong stuff for people who are no longer racing, even though the low weight of the bike tries to simplify the task. The Scarp thus wants to attack, and wear down the opponent with rhythm changes. Here we come full circle to the aforementioned racer wisdom, because these types of tactical maneuvers were never the intention of the tester. When used as a long-distance diesel locomotive, the smoothness and the ability to gradually advance to the sensible maximum and being able to hold it there speaks for the Scarp's abilities. 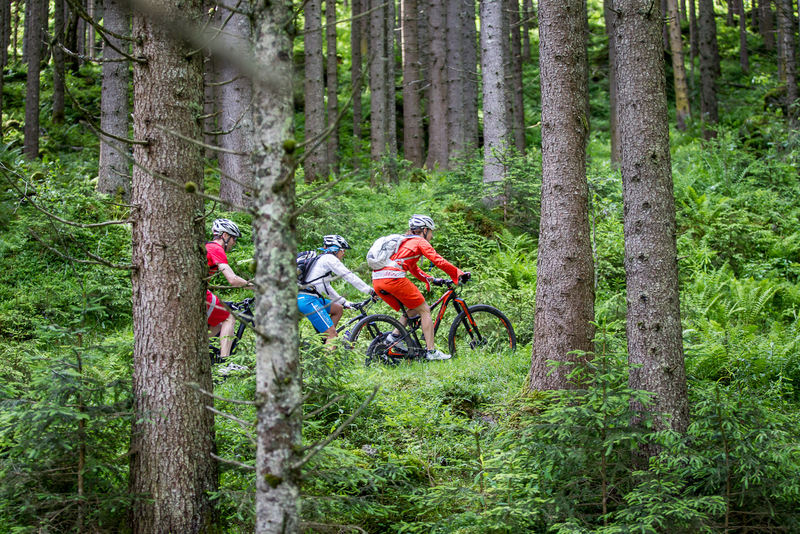 But additionally, attacking or changing the rhythm suddenly becomes fun – simply because it's made so easy. 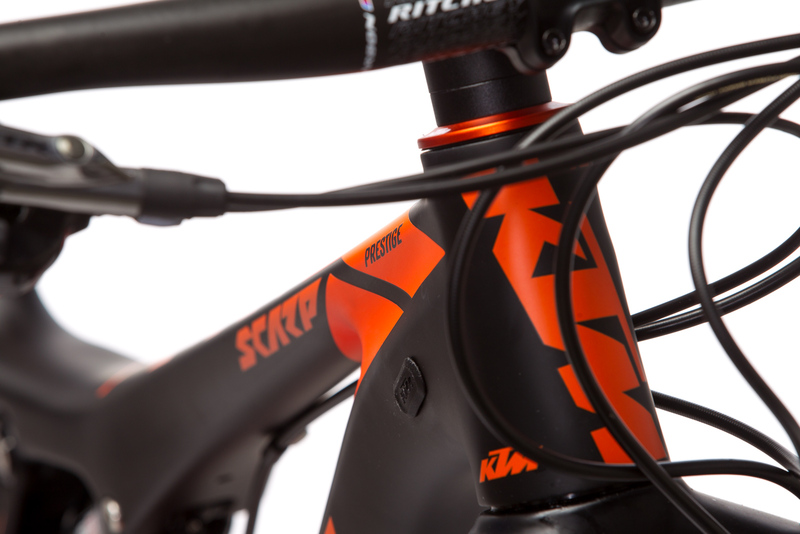 The KTM Scarp is a thoroughbred racer. Elongated, but interpreted in a modern way, the stiff carbon shooter with its ten kilos pulls away like an arrow and pleases with very balanced handling and steering precision; Its special discipline is slightly bumpy, wavy, gently curved. 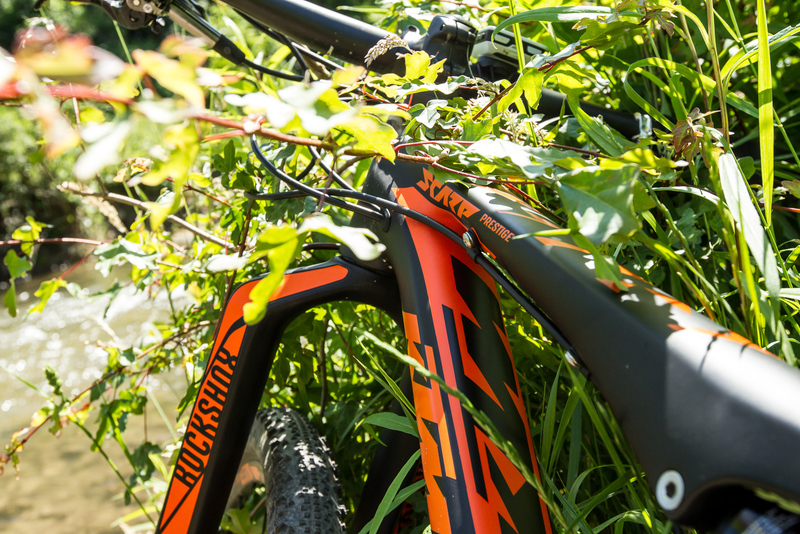 The new SLL rear end surprises with excellent qualities and traction capabilities, while remaining as efficient as one can hope from a racer while being so sensitive to be specially loved by long-distance riders on a long run. 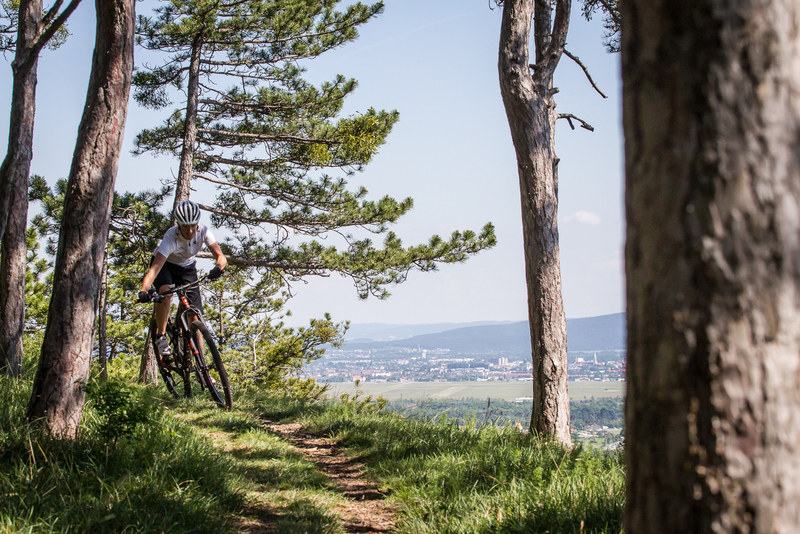 The fork is a prime example of sensitivity while simultaneously being able to handle major hits or little drops with aplomb. 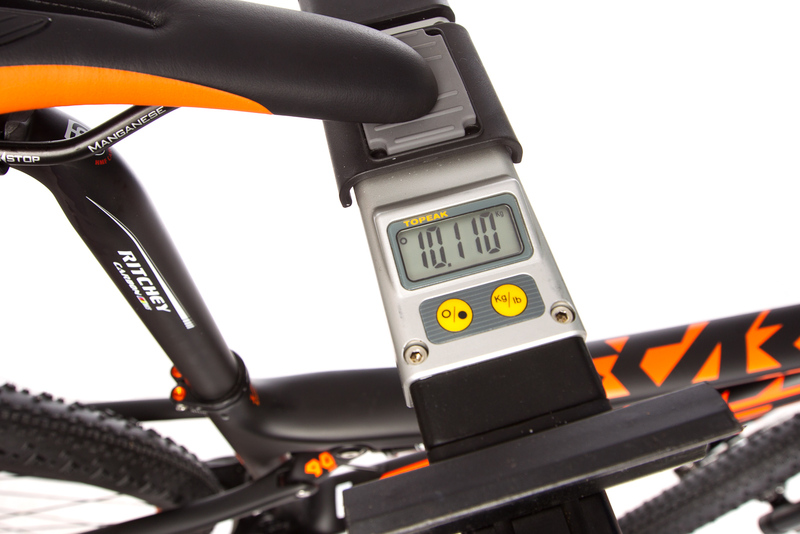 We could not reproduce the lack of stiffness of the RS-1, stated in other test reports (due to the rider's lower weight? ), on the other hand, the fumbling during the assembly and disassembly of the wheel annoyed us (due to numerous car transports). The components are top class, which is to be expected from a contender in the high price segment. 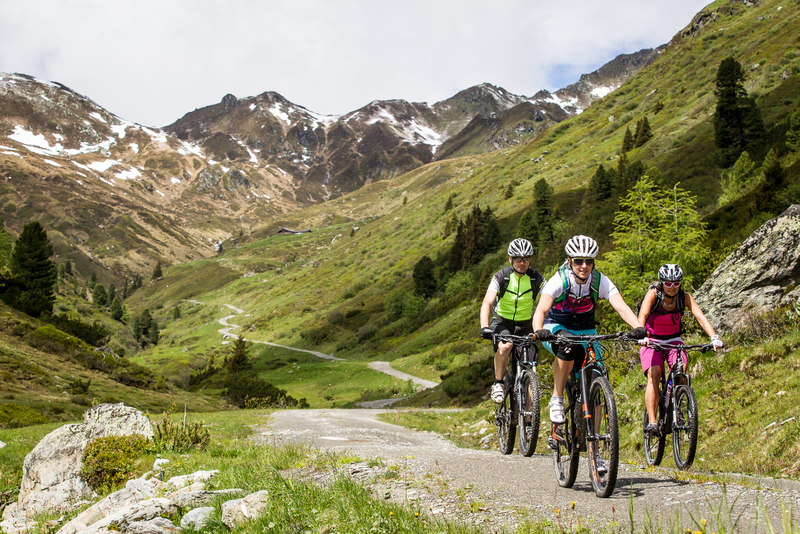 The gears and the brakes perform their services accurately and reliably throughout; the other parts, especially the wheels, are fine mixtures of light, stiff and durable materials. Only the semi slicks are expendable (when is it ever dry this season?). 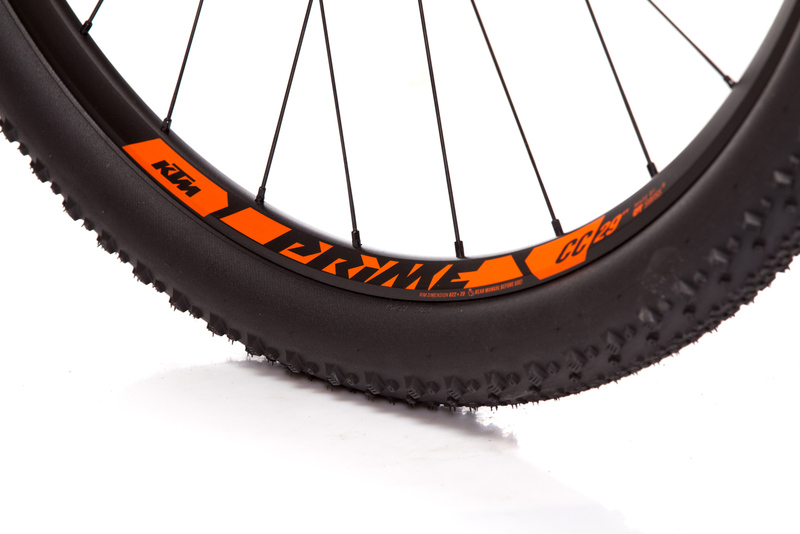 It'll be difficult not to invest in a reasonable set of tires that will add around 300 g extra weight to the total. 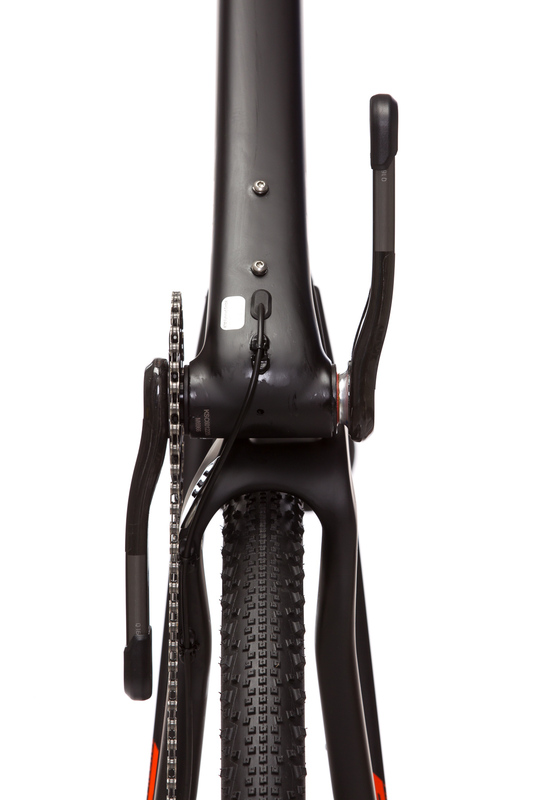 Adding the few extra grams for a seatpost quick release would also be worth considering. 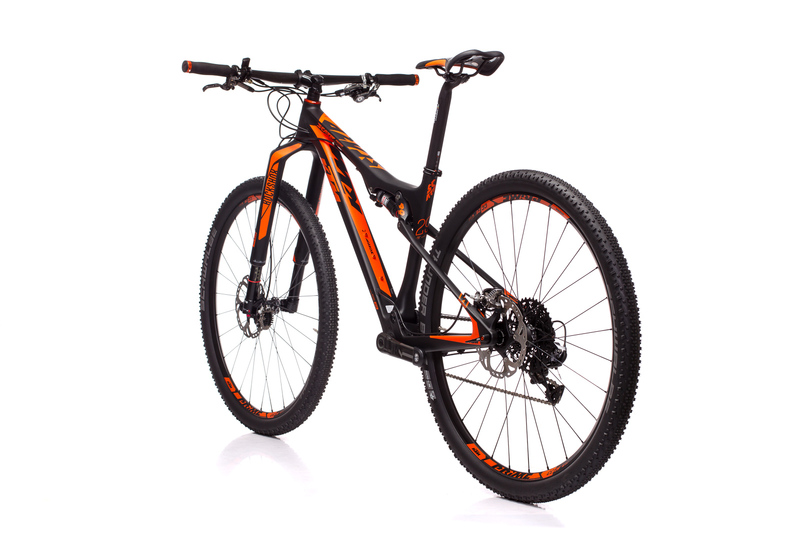 To be fair, the parts also remain very valuable with the slightly cheaper models and the full carbon frame is available from models onwards of four and a half thousand euros, only below that range aluminium is used. 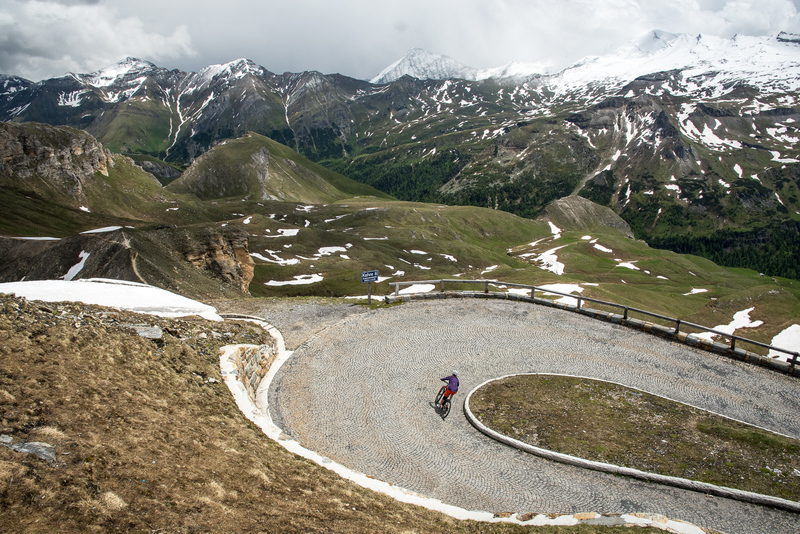 Thus, the bottom line is, that there is much to commend, but there is a real downer: The benefit of all this is only available for riders from a height of 1.70 m and onwards. 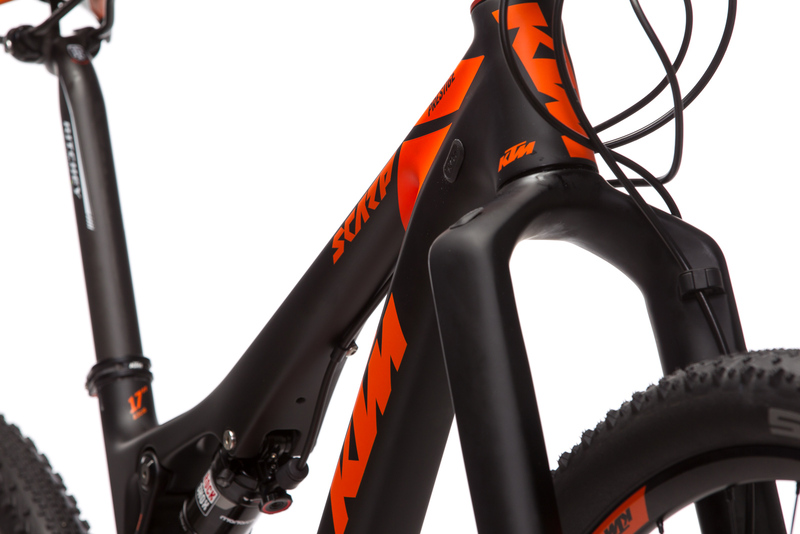 People who are smaller must hope that KTM comes up with a 15" frame size of the Scarp.